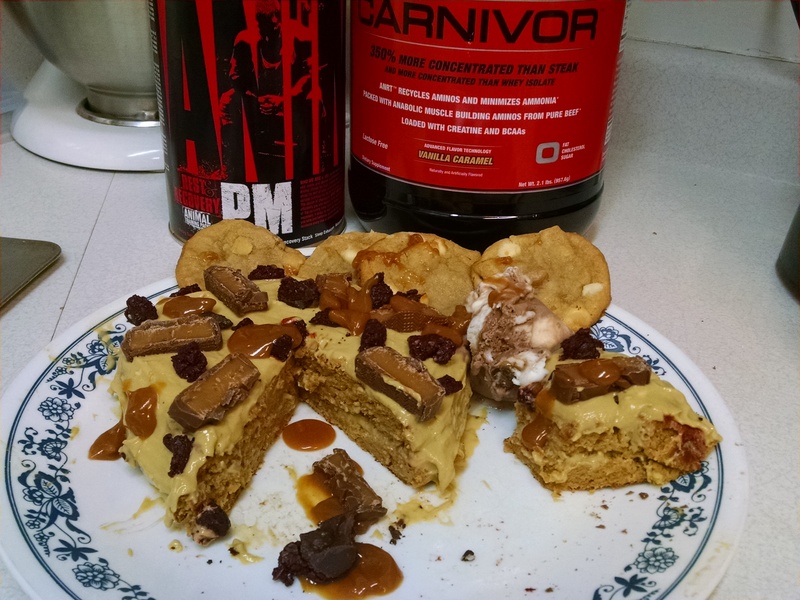 @completenutrition Salted Caramel Cashew review. Pretty good macro split, just a bit higher than your average bar. 65g total bar so typical size as well. 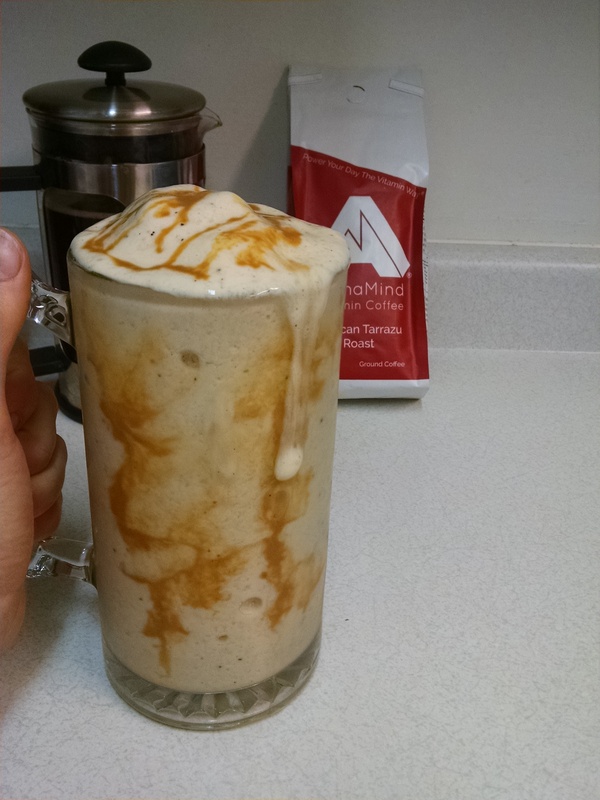 It’s got a tan based bar with crushed up cashews in it, then layered with a caramel base. Real food based bar with 10g of Whole Foods, good amount of fiber, coconut oil for some healthy fat source. Faint salted caramel aroma, nothing to strong. It’s got a few crisps in there but can barely tell. The bar has a great chew with it, could just use a bit more texture appeal for me. Main flavor with this bar is the salted Carmel. Don’t get a ton of cashew, so if it wasn’t on the label and I didn’t see them I might not know they were in the bar. Flavor wise it reminds me of eating a caramel chew or caramel candy. Definitely was a nice treat. Maybe increase the salted part just slightly. Overall this bar was delicious and definitely recommend giving it a try. 250 cal / 10f / 33c / 20p . Highlights: 10g of Whole Foods, 19g of fiber, sweetened with stevia, and 5g of sugar. Very nice aroma with a chocolate covered cherry smell tickling the nostrils. 72g bar so just a bit bigger than quest bars. Chocolate base bar with a dark chocolate under coating, crisps scattered throughout the bar, and lots of cherries visible on the top. Really good chew with this bar, and the crisps give it nice texture. Good blend of chocolate to cherry in this bar. Main flavor I get is chocolate with cherry accompanying it. I do get a bit of a dry cocoa powder aftertaste though. I think some sea salt would of made a killer edition to this bar but it’s not needed. I would increase the structure of the crisps a bit so they give off more of a crunch or last longer, but that’s personal opinion. Overall this was a really nice bar and a bit of a change up and bit different than your usual quest bar. Excited to try the other flavor I have. . Overall – 7.8/10 , not a huge cherry fan so you might rank this even higher! Would pick this up over most quest flavors tho . Have you guys tried these yet? What you think? Definitely a solid pick up if you haven’t yet. .
Here’s a few other pages you might like! Very nice brownie/chocolate aroma when first open. Not a very big bar at 40g. Nice chocolate coating with a chewy chocolate filling. Slightly weak on the chocolate flavor in the bar itself. The almonds seem more like ‘crispies’ you’d fine in a combat bar or something similar but not nearly as large or pronounced. Almost non existent. Didn’t give me a brownie taste at all, more of a chocolate covered cherry almost? But really faint flavoring in general. Warming it up did make it a bit better but definitely lacking overall flavor. Definitely not something I’ll get again. I also just posted Savory Pancake Pizza and Chocolate Pudding Muffins I thought you might enjoy as well! In a bowl place 20g protein, 30g self rising flour, 8g sf ff vanilla pudding mix, 5 splenda packets, 1 tsp baking powder. Mix well. 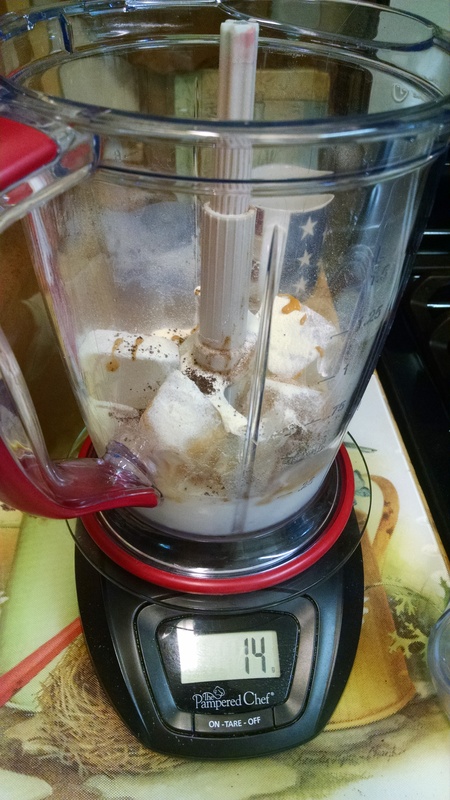 Then add in 46g egg whites, 61g unsweetened applesauce, 1/2 tsp vanilla, 10g @waldenfarmsinternational caramel syrup. Mix everything well. Place in a sprayed ramekin and bake at 350 for 20min. Take out n let cool. 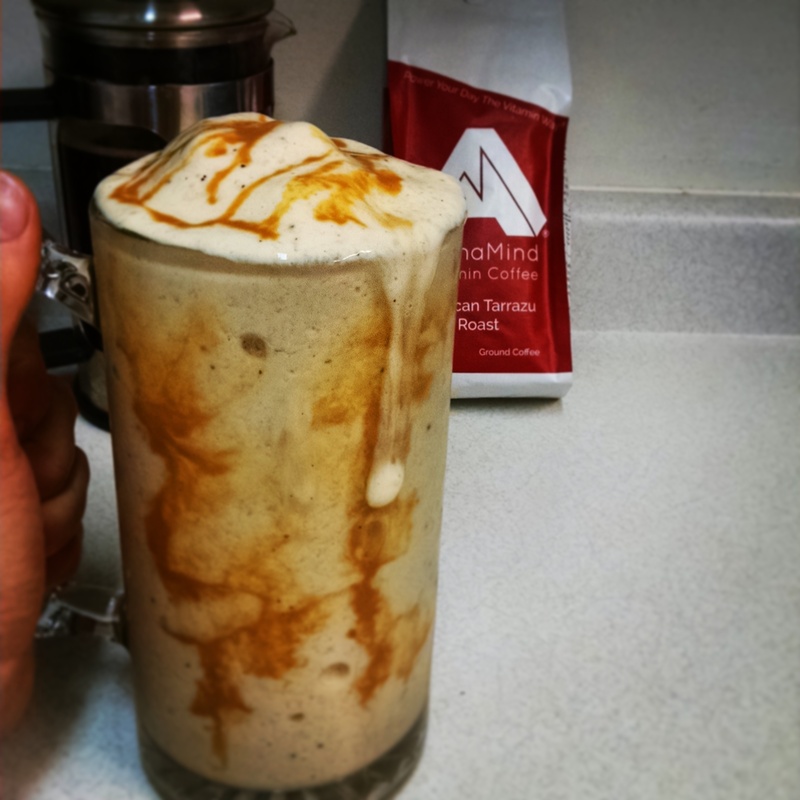 Topped with 34g @nutsnmore salted caramel mixed with more caramel syrup. 40g crushed Reese’s to finish. Be sure to follow me on IG @the_flexible_baker and be sure to check out my new cookbook ! So I decided to give a go at baking with beef protein. 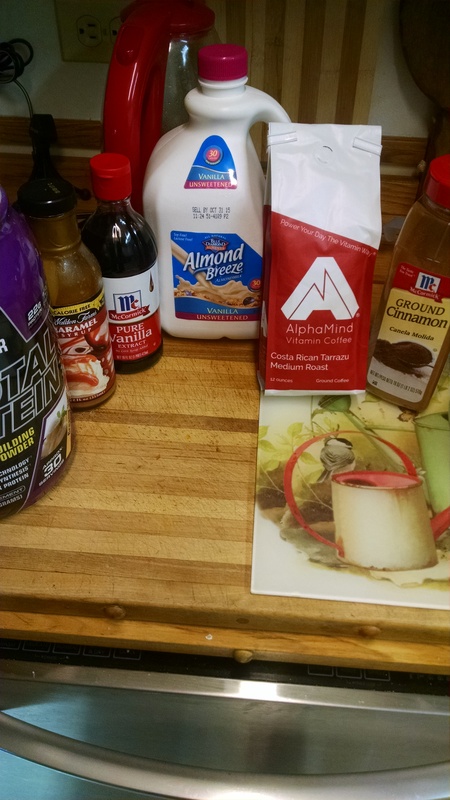 Now usually I would add 4-8g of SF FF Pudding mix but I was out so I skipped it. Mix all that together and throw in a sprayed baking dish and bake roughly 20-30 min at 350. I have been playing with trying to get more rise in my cakes so lately I have been whisking the egg whites a bit in a separate bowl then adding them last but I don’t think it is helping. Once the toothpick test comes out clean pop that bad boy out to cool for at least 30 min. Once cool cut in half and spread some of your frosting in the middle of the cake. Once Frosted either add some toppings or just enjoy! 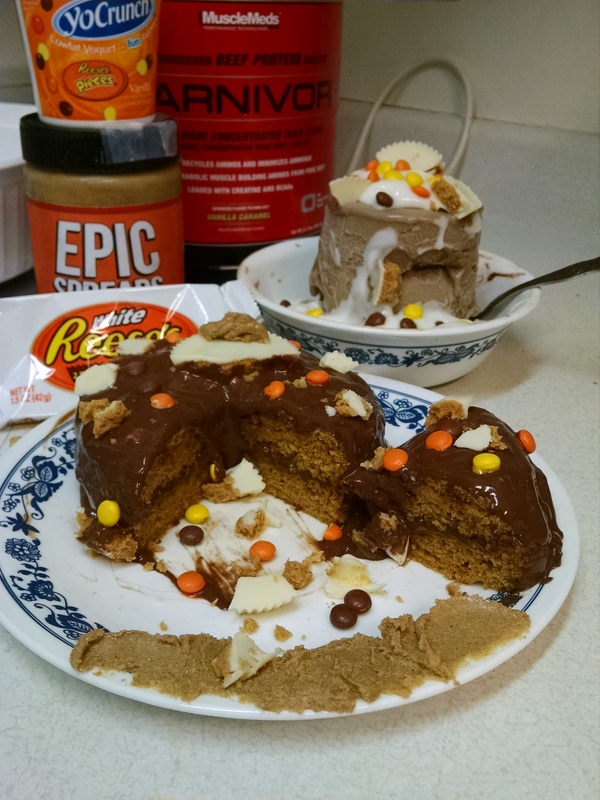 Macros for the Cake are 502 cal 2.5 fat / 70 carbs / 53 protein and a whopping 15g of fiber ! I also used almost the same identical recipe and made this amazing cake as well. Vanilla Carmel Cake with a Vanilla Frosting. Super Versatile Cake. Give it a go and let me know what you think! Remember if you liked the cake be sure to check me out on Instagram under d_chron or hashtag #dustyscalculatedmadness !! Once frosted restack the cake and continue frosting with remaining frosting. 5-15g Caramel @waldenfarmsinternational depending on lvl of caramel you want. 90cal 3f/6c/12p and 3 fiber. Don’t forget to check me out on Instagram and if you like my stuff be sure to give me a tag so I can see it! Otherwise always throw down the #dustyscalculatedmadness hashtag to! Drink on my Coffee People!